Maybe it's the distinct coloration of the bright green stalks and the bright green stems holding individual blue flowers at their tips that gets me all shivery when these plants are on the verge of blooming. You know that goose bumply feeling a gardener gets when a bud or a bloom emerges on a favorite bush or shrub. No question I love that perfect hue of green and blue contrast. 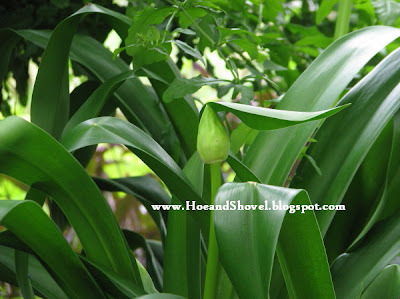 It is quite possibly the height of the sturdy scapes extending 3 and sometimes 4 feet erect and tall above the foliage that gets me so excited when May comes around and the buds start peeking out one by one on the Agapanthus plants. It's been my aim over the last couple of years to place them in more locations throughout the garden. The 'clumps' are easily divided by digging up the rhizomes, separating them, and creating new individual plants that multiply more rhizomes and then we just repeat the same sequence... dig, separate, create. 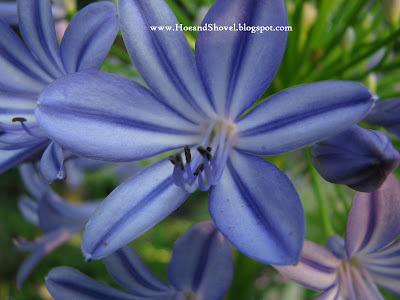 The Agapanthus africanus goes by several common names: lily-of-the-Nile, African lily, African blue lily. I like them all but mostly I refer to them as lily of the nile. There isn't anything I dislike about this plant. The glossy, fairly thick, strappy leaves are evergreen. 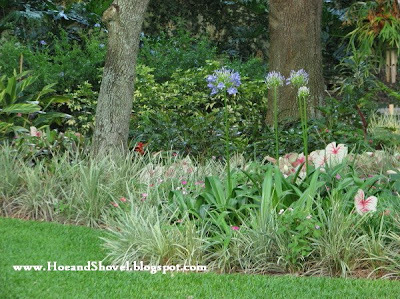 And this winter when so many of my tropicals were leveled by the rare frosts we experienced the Agapanthus never even paid attention to the low temps. With such hardy characteristics my esteem for them has increased exponentially. It is interesting that they bloom in a sort of rythmic rotation around the garden. Mine are all growing in partial shade where they receive a couple of hours a day of sun streaming through the tree cover directly onto them. But I've seen them growing in lots more sun and lots less sun. I'm telling you, they are extremely versatile, must-have plants. The first ones always appear sometime in May. Those early arrivals are turning to seed to now. Since I love everything about this plant, I leave their pretty green seed pods standing high in the air for another dimension of visual appeal. Once the bud wiggles its way up through the air it will slowly pop open to reveal the most delightful, spherical, puff of blue blooms. Each sphere is loosely laden with so many little blue tubular or trumpet-shaped flowers. Every one with a lily-like appearance and each one making its own small contribution to the overall charm and effect of these blooms. The Agapanthus (can you tell I just like saying that word) was my number one pick in the April post, The Six Plants I Can't Live Without. you can't beat those qualities! We have gotten a couple of days of good rain from heaven which makes the garden and the gardener thrive. It gives us both a little break. With rain still falling it's a real good Saturday for a nap... that will get me all rested up before the grand-kiddos arrive this afternoon for a sleep over at Mimi's and Papa's. Agapanthus always reminds me of when I first started gardening. I didn't know about zones etc. I just stuck things into the ground and expected them to live forever. Ha... I will never forget the disappointment when the agapanthus didn't come back the next spring. I still think they are so pretty and wish I could grow them. Have fun with the Grands. While traveling to Yosemite some of the lower elevation towns we visited ahd huge masses of these, the first I can recall seeing. Guess they don't like NC as I've not see them around here before. Nice post! Thanks for an interesting post. I learn so much from you. I say amen to everything you said about this lovely plant. Now if I could just find the Clerodendrum paniculatum I would be a happy camper. There are lots of the Glory Bower..just not this one. I think yours is one of my favorite gardens for one of the lovely combinations and plant variety. I think my agapanthus is in too much shade. I wish it would bloom! i am all for the naps...they have helped me make it through a lot of times. so enjoy! we actually had an agapanthus at our garden center the day and i sat there debating on whether i should get it. i think it would be an annual here so i passed. i am glad to enjoy yours though and so happy you love them. i really like them when i see them en mass. well enjoy your grand kiddos/ we had the cardinals here for an early dinner and it was nice. not much going outside as the heat was so bad. have a great summer sunday. Meems, I love Lily of the Nile too but since it's an annual here, I have to talk myself into it. I saw some at the garden center the other day and was so tempted - I may go back. This is really kind of creepy but agapanthus first came to my attention during all the coverage when Nicole Brown Simpson was murdered. The TV cameras kept showing the cement walkway outside her townhouse where her body was found. But what I focused on were those tall blue umbrels of heavenly-looking flowers in front of the crime scene! I had to do some searching but finally figured out what they were. I guess you never know when you're going to see a plant you have to have. Yours are fabulous! Meems whenever I see agapanthus I get breathless. I have a few struggling in a pot and am tempted to put them in a bed. They seem to do very well in Florida at least in your parts. Do you know they come in white as well? I have seen them here in one of the luxury estate's gardens. Good that the rains have arrived for you. I am still awaiting for the deluge....until then am watering. Enjoy your day! I remember those days well, too. There is no telling what all I was sticking in the ground thinking 'if they sold it at the garden center then it must be for Florida'. We live and learn and some plants we have to admire from a distance. Just getting to glimpse them in bloom is a joy. I'm sure you could grow them but they would be an annual. It's interesting that lilies come in all shapes and sizes and heights isn't it? The individual flowers on these look more like lilies to me than the overall flower. I do adore the tall scapes on this one. Oh, I do think you will be happier with the Pagoda over the Glory Bower. Although they are much the same I've heard the Glory Bower can be very invasive. The Pagoda drops its little plants too but they are easily uprooted. I don't think I've ever seen one for sale anywhere now that you have me thinking about it. You are sweet to say that... thank you. Come by anytime. They will bloom better with some sunshine but I've seen them blooming in the shade, too. I would move it just to see if it makes a difference. They also like a little extra moisture during bloom time... the rest of the year they are not overly thirsty. Oh, that nap came in handy. We swam, we baked cookies, we played games, we ran around in the garden... you get the picture. Shhh... they are still sleeping this morning. A really nice post. I grew a stunning Agapanthus last year that had really dark blue flowers called 'Mood Indigo'. Then we had the worst winter for over a decade, and it never came back. I'm still sad about it now! There is a garden on the next street that has loads of different Agapanthus in the front garden. They all bloom in late summer, which is an amazing sight. Your story is very interesting and more current than you know. Just yesterday the news was on and of course the death of MJ is dominating every news cast. I looked up from what I was doing to see one of the reporters standing in front of a mass of beautifully blooming agapanthus and without thinking said outloud... "look at those beautiful Agapanthus behind that reporter." I guess we know they do grow well in California. As soon as I get as many as I want in the ground I am going to try some in pots as well. I hope you do and I hope they bloom for you. They do come in white and a darker purple. I confess to purchasing the darker purple variety recently. Immediately I divided it before planting it so I have two and one is budding. The plant itself is not as striking in my opinion as the leaves are much thinner and not as thick. But I thought they'd be nice bordering the blue ones. We'll see. To look at the weather map it looks as if you should be getting rain ~~~ so much activity going on down there in the waters around you. Hmmmm... surely this week you'll get your rain... I better keep doing my rain dance. I had taken a break for the weekend. :-) Have a great Sunday... hugs to you. I'm so sorry about your pretty agapanthus. Winters will do that on occasion. We had our worst as well and all mine withstood successfully. The 'mood indigo' is the one I recently purchased for the first try here. The information available on the Internet is a bit conflicting about this hybrid. But it does seem to be one that will survive winters as far north as Zone 5. I have my doubts on that one but I guess it's possible if sited in ideal conditions. Our blooms come earlier down here due to our high temps early in the spring. That means we are all bloomed out on this one by late summer. The green pods left behind will hang onto the erect stems and turn brown eventually well into autumn for another element of interest in the garden. I love the agapanthus! Such a beautiful plant. I managed to keep one for two years, then it didn't come back. I love them too. The look so pretty in your garden. My Mom just passed some type of lily onto me that she was given. I think it is agapanthus, I hope so. I'm glad to see they work in part shade too which I have lots of. It has been a good year for them in my garden as well. Plenty of rain this spring....great post! Beautiful! Mine didn't bloom this year, I hope they do next year. That's a great succes in your zone if you left it outside... I'm impressed. Oh I hope it is an agapanthus~~ wouldn't that be fun. I'm thinking in your climate an agapanthus would probably like a little more sun than not. They do like that rain when setting bloom. Happy to hear yours are doing well, too. In your sunny yard I would think they would be very happy... hopefully next year. So frustrating when our charming comments don't get published. Thanks so much for a second one. You have a point. Those alliums are just hard to beat but it goes without saying ~~~ here, they would never work. 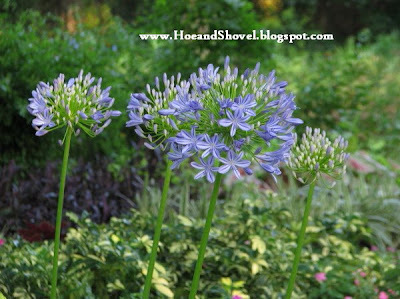 Agapanthus actually thrive in the heat and they can take a mild frost with ease. Yours would do well if you planted them on the edge of the shade so they could get a few hours of filtered sunshine (is that possible? )a day at C & L. You might have to dig them up for winter but then again~~ maybe your shade would protect them. OR... like you said... just put them in a pot... that would be your safest place! Glad you stopped by my place on a rainy day - it inspired me to get out and visit some. The weather here has only given us a taste of summer. I could count the days it went over 80 F since on one hand so far this year. We've had more than our share of rain and cool temps. You might like saying 'Agapanthus' but I have to stick with Lily-of-the-Nile or my wife will have to untie my tongue when she gets home. I'm with you though - it is a nice plant and I too like the way the seed pods look. Too bad they wouldn't take my frosts. This plant is definitely a keeper. It always looks great and you, definitely, cannot beat the large beautiful blooms. In May, New Orleans were bursting with Agapanthus - they were oh, so stunning! and yours are just as gorgeous. I NEVER see them here in Deep South Texas - but I would think that if they like N.O. and Florida, they would do okay here, right? We had a rainy day today, too (for which we are very grateful I might add). Only I had errands to run and couldn't stay home to catch up on visiting blogs... always something. Lily of the Nile sort of rolls off the tongue nicely... it works. But sadly it wouldn't like your snow covered NY. One would think they would do well in TX... although I know Annie in Austin has mentioned they don't do well for her. She is zone 8 and you are further south --- I would give one a try and if it does well you can build from there. 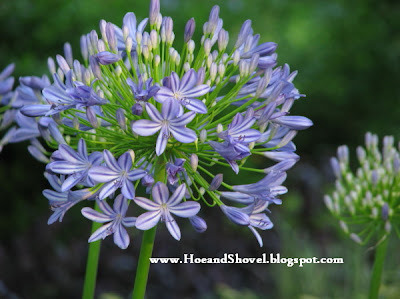 Hi Meems, Agapanthus is such a pretty bloom, and looks right at home in your beautiful garden. I can see why you love them so much! I've never met a blue flower I didn't love. Agapanthus are beauties I'll enjoy at a distance since they're not hardy here, but as Gail already has, I may have to add some alliums here after seeing them everywhere during Spring Fling. i realize this is a very late comment, but i have not been online much this week. anyway, i want to thank you for turning me on to the 'agapanthus' plant. the first two i planted last fall survived the freeze, so i was sold. i only have five plants (three of which i divided from a very large single plant i bought in the spring), and this is their 1st season in my garden, but they all gave me blooms this year. they are under one of my crepe myrtle trees, which gives them partial shade, and they are doing well so far. i also left the seed pods after bloom, as i wanted to ask you first before clipping them back. Do they reseed from those? i would love to see them enmasse in a garden, as some of your readers have commented. and i also love the way your plants are interspersed in very visual spots in your garden. agapanthus are truly a spectacular showy flower. Oh how I would love to be able to grow alliums. 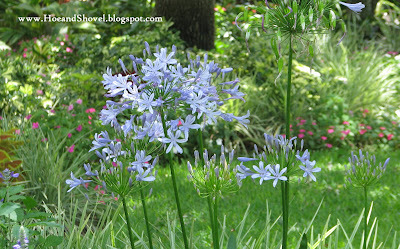 Agapanthus are called blue but they really are more on the periwinkle side of blue... but I think that passes. Never too late to comment! :-) I'm SO glad you finally tried this plant... you are going to love the ability to keep dividing these and making even more to sit at the feet of your pretty crepe myrtles. I'm trying to acheive that en masse quality with mine ... now that I have so many. I'm working on planting them in "ribbons" throughout the garden. Maybe next year they will all bloom at the same time and give me that showy mass I'm looking for. Fingers crossed. Your pictures are beautiful! I hope you can help...my Agapanthus plants are dying!!!! I enjoy them so much but here in Spring, TX, it's been so dry. Now I believe they have a form of root rot! Sounds terrible and I'm searching for remedies! Maybe you can help! They began wilting and turning yellow. A remaining cut stem from a bloom was terribly soggy when I pulled it out. Then is when I realized the root ball was soggy. They are approximately 3 1/2 years old. I don't want to loose anymore! I have pictures of when they were in full bloom....ABSOLUTELY BEAUTIFUL...some blooms 5' tall! I am SO sorry to hear of your Agapanthus troubles. What you stated was a little confusing in that you said it was so dry but then soggy. I'm assumming the dry conditions changed from weather or maybe you overwatered? In any case it might be necessary to dig them up and pot them in a container in order to control their environment for a little while. Just a thought I had as I read your dilemma. I don't know how many you have so I don't know if digging them up is feasible but it seems to me you could pamper them a bit if they were in a container. At some point when they recovered you could try putting them back in the ground. Other than that ~~ I wish I had a tried and true answer for you. I wish you all the best... would love to hear how they end up. BTW, thanks for stopping by Hoe and Shovel. Thank you for responding...I believe we have a "fungus amoung us" here in Spring, Texas! Not good news! I'm still doing research about the type of fungus which looks like "root rot" but isn't. My agapanthus are in a raised bed behind our pool, so drainage doesn't seem to be the problem. Strangely enough, the soil around each plant is dry due to the excessive heat we've been having. The leaves are drooping from the outside first and then the center is a celery color...very light. If you don't mind, I'll send pictures of before (Spring time) and after. It's amazing and sad at the same time, the difference! Hate to be a bummer on your blog but I think it's good information to be aware of. I may have to start all over with removing all plants and root systems, treating with "whatever needed" and amend the soil and replant. Agapanthus are totally worth it!!!! They are typically easy to care for, and love the sun and heat! My husband, Tommy, always cringes when I prune my plants. He always says..."You're killing them"!!!! I don't look at it that way. Prunning produces stronger and better growth for my plants, and "spiritual" prunning produces "spirtual" growth in me! It's all for good!! Again...thanks for responding and I'll let you know what is to come! If agapanthus aren't hardy in your area, you can always grow them in containers and overwinter them indoors. They do great in pots and seem to bloom better when their roots are crowded. You can reduce watering and basically let them go dormant until you take them outdoors in spring. One question I get about them all the time is why won't they bloom? Anybody have the secret formula? 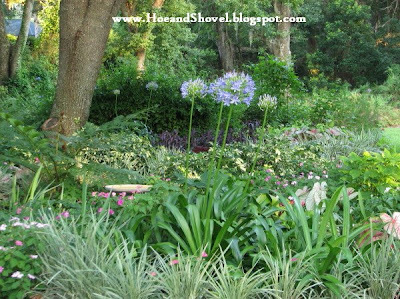 I live in Orlando and am thinking about planting some Agapanthus on the south side of my house. That area is in full sun all day. Do you think it will be too sunny and hot for them? Gosh, I don't know how it happened that I never responded to your question. Not that I have a rock solid answer. 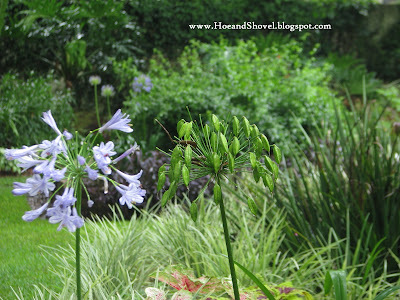 But it has been my experience that agapanthus need a bit more water than normal at bloom time. They can also use a good dose of a balanced fertilizer or what I like better is adding some bone meal into the soil around their roots about a month before bloom time. Hope that helps. Thank you for your comment. I've seen agapanthus planted in full sun in our region and they always look a little bit stressed... to me. They will actually handle that much sun but I don't think it is the best case scenario for them. If you can place them somewhere with a little reprieve from the hottest part of the day it would be better. Even shifting shade would help. Hope that helps. 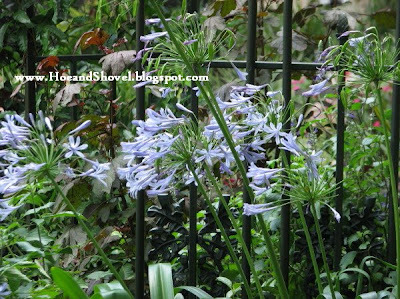 I just returned from LA where I saw these beautiful flowers growing everywhere: Agapanthus Africanus. I live in South FL and am trying to locate a place where I can purchase some to plant in my garden. Any suggestions as to where I can but them? Thanks.